Vintage steals make this minimalist Texan house feel totally unique. Part of the advantage of designing your own home from the ground up is the freedom it lends to creativity—which, as a photographer, was a pretty essential quality for homeowner Kate Turpin. “The goal of the space was to focus on complementing the surrounding hill country landscape by framing it in big, picture windows in every room, and using simple but warm, textural decor,” explains Turpin, who designed the house with her husband and recruited a builder to help bring her vision to life. The space may be a new build but at its core, it’s all old-school charm. Situated roughly two hours west of Austin, the home is new in the most literal sense of the word: The couple built the 1,400-square-foot space entirely from scratch as a guest house addition to a property that had been in the family for about 10 years. But despite its 2018 origin date, even the architecture is rooted in history, inspired by the photographer’s travels to Mexico, Spain, and Peru and the traditional homes she saw while there. 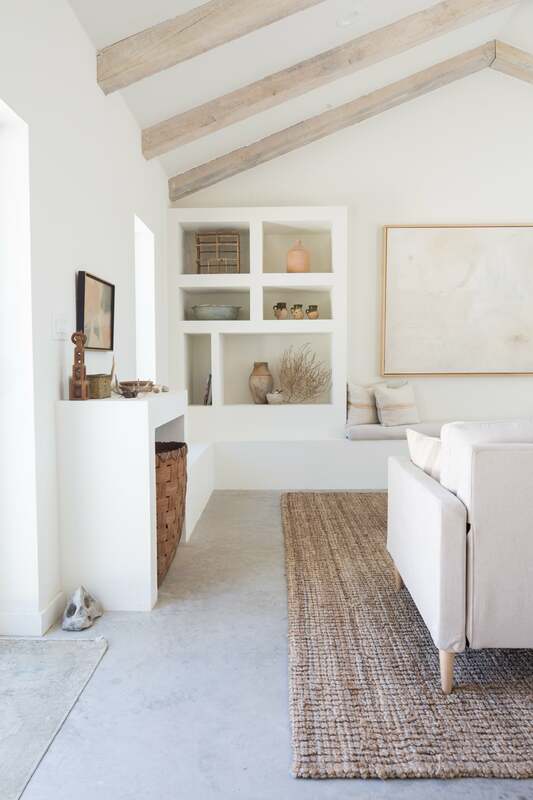 Thick, textural walls (the top wishlist item for Turpin), a clean, whitewashed backdrop, and rustic wooden beams place this house somewhere between Oaxaca and the Mediterranean. With three bedrooms and two bathrooms, the home has ample room for guests and is prime for hosting family and friends during the holidays. The abundant natural light makes it an ideal spot for photography and Turpin capitalizes on the brightness by using the guest house as a studio when she needs a quiet place to work. Despite being total novices at home renovations, you’d never guess this was the couple’s first attempt at construction and design. And aside from some minor hiccups—“I forgot to put a closet in one of the rooms!” says Turpin of her only regret—there’s nothing much she would change about the “minimal Provencal farmhouse”-inspired space. The stunning dark green, iron door (which was the result of a compromise on installing steel windows throughout) served as the jumping-off point for the rest of the home. The couple, who completed the project over the course of nine months, filled the home with memorabilia from their international travels, vintage treasures, and sentimental pieces, culminating in a peaceful retreat. Read on to get the lowdown on how Turpin and her husband managed to pull the whole thing off. Did you start with your wishlist items or priorities? First were the thick walls; they were my number one priority. Secondly, natural light is really up there for me as a photographer. I wanted a space that I could shoot and work in. We focused mostly on the kitchen and main area. Speaking of the kitchen, what made you choose open shelving? That was a fun idea because we could get away with it as a guest house—I don’t know if we could in an everyday living situation. But it was fun because we knew people weren’t going to be cooking in it every day, and honestly, cabinetry is expensive. We don’t have one drawer in the whole house! [So it] was a cost-saver, but I like the look, too. So would you call it minimalist? It’s kind of a little bit of everything! I would definitely say it’s minimalist. Also kind of rustic; kind of provincial French country. Is the style reflective of your personal style? Definitely! If I could have that look in Austin, I definitely would. Is this place vastly different from your home in Austin, then? The furniture is very similar and so are the colors; I gravitate towards really earthy tones and textural furniture. Neutral color palettes are very natural for me. I have to bend to get to color! But as far as the layout, in Austin, I tend to go for older homes that have character. With a new build, I wanted to go more modern and clean. How do you make neutrals more interesting? Texture is big. I was looking for woven furniture, and finally found the two woven chairs (in the living area) that I’d been looking for four months at a thrift shop. The wood [shelves] in the kitchen were a last-minute decision because I couldn’t decide if I was going to paint them white or keep them wooden. I was worried that different tones of wood would just clash, but it really just helped warm the kitchen up more. Speaking of thrifting, a lot of the items look vintage. Where do you source your decor? I like to scour Craigslist for deals. I also worked with Room & Board and used a lot of their really clean sleek tables; the metal coffee table and side table help give [the home] a more modern feel and add some contrast. Most of the furniture actually came from my parents’ house in Houston; their house flooded in Harvey. My dad’s desk is the kitchen table. That’s where he worked for 15 years, and I love that. A lot of it are things I’ve collected through travel. I got a lot of Turkish pots, and some things from Round Top here in Texas. There’s a woven rug in the bedroom from Oaxaca. A few of the woven baskets are from Africa. Those green glasses, I got in Morocco—the one color I actually do love is green, so there are little pops of the color throughout. Do you have any tips you can share for flea market shopping and thrifting? If you’re there for more than one day, walk the market without buying anything the first day. Then go back and see what popped out to you. I had a tour guide once tell me, “enjoy with your eyes”—I’ve kept that mantra in my head because [markets] can get overwhelming! Is there anything that stands out as a favorite item? The vintage woven chairs in the living room are my favorite find, and my favorite smaller piece may have to be this antique straw hat that sits on the kitchen counter ledge that my mom purchased years ago at a Denver flea market. I’ve always loved it. Can you tell me about designing a guest house versus designing your actual house—did you enjoy the freedom or did you find it more challenging? I found it a lot more freeing because as a guest house, you don’t really need to have everything perfect, and storage is not super crucial. It doesn’t have to be as functional. The whole goal was making the place feel like you [could] walk in and automatically feel refreshed; like you could breathe. Hill Country is our escape and our place of rest. We really wanted to focus on that, and being as simple as possible with the design. Have you found that being in a creative field like photography influenced the way you designed the space? I tend to put things in vignettes. I think that’s why I put so many [nooks] everywhere—I’m obsessed with styling little niches and putting objects that I found in nature in them.